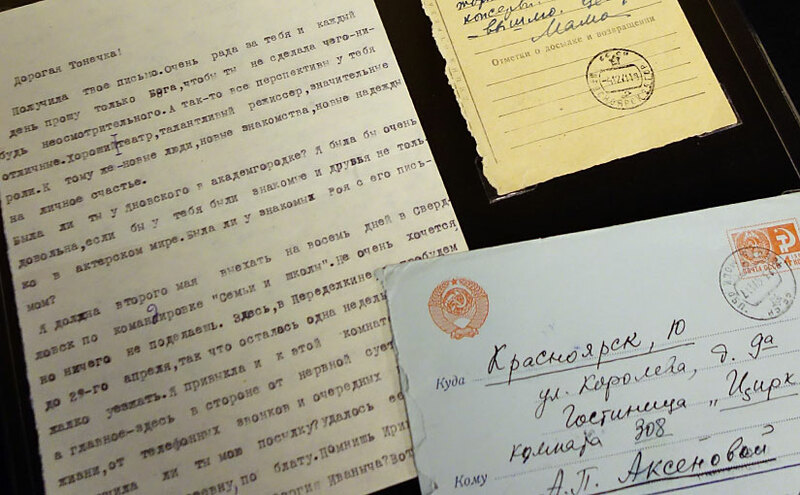 This month’s spotlight exhibit features materials from the recently acquired archive of Evgeniia Ginzburg, the most famous woman prisoner of Stalin’s GULAG, and Antonina Axenova (Ginzburg’s adopted daughter). 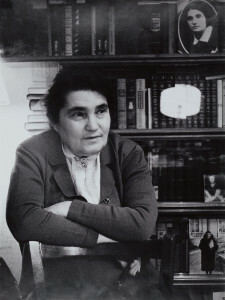 Evgeniia Ginzburg in her Moscow apartment, 1968. Evgeniia Solomonovna Ginzburg (1904-1977) was a journalist and teacher who wrote an acclaimed autobiographical account of her 18-year journey through the Stalin GULAG. Ginzbrug’s epic story, which has been translated into many languages, was published in English in two volumes: Journey into the Whirlwind (1967) and Within the Whirlwind (1981). To this day her work remains one of the most significant and widely-read women’s memoirs about life and death in the Stalin camps. Born in the Kolyma camps in 1946, Antonina Pavlovna Axenova was adopted by Ginzburg in 1949. Axenova later became a theater and movie actress. She has also worked tirelessly collecting materials to preserve the memory and legacy of her mother. The exhibit is timed to coincide with a visit to Notre Dame by Antonina Axenova and the filmmaker, Mario Damolin, who premiered his new documentary film about Evgeniia Ginzburg entitled Tightrope Walk on November 5 at the DeBartolo Performing Arts Center. More than 7 boxes constitute the archive which consists of documents, letters, photographs, and some manuscripts relating to Ginzburg’s arrest and her life in the camps as well as materials about Axenova’s professional life. The finding aid is near completion and will be accessible to researchers in the near future. The exhibit is curated by Ken Kinslow, Manuscripts Processing Librarian, and is open to the public 9:00am to 5:00pm, Monday through Friday, through December 11, 2015. This month’s spotlight exhibit is curated by Aedín Ní Bhróithe Clements, Irish Studies Librarian, and features 6 volumes from 32 recently acquired books written by W. B. Yeats or associated with the Yeats family. 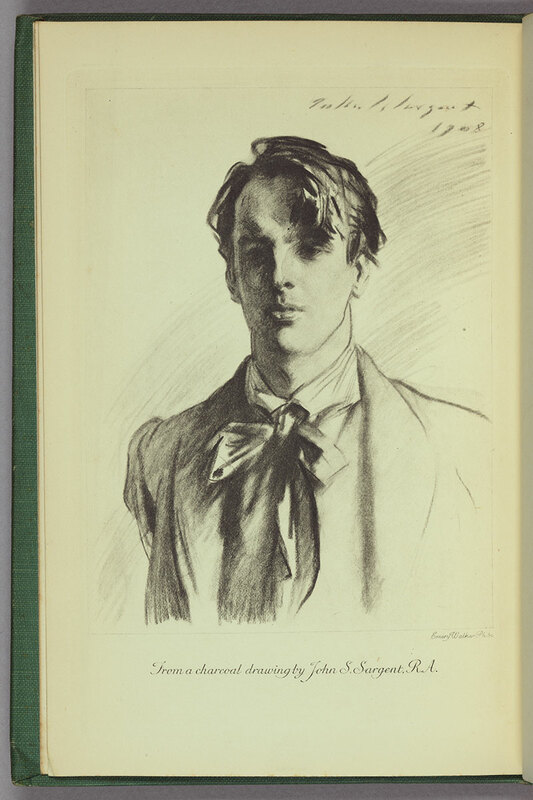 W. B. Yeats (1865-1939) was a leading figure in the Irish Literary Revival. One of the greatest poets of his time, he was also a major force behind Ireland’s national Theatre, the Abbey, and had a great and lasting impact on Irish culture and literature. Yeats was awarded the Nobel Prize for Literature in 1923. Visiting professor John Kelly alerted the Library to the availability of the Yeats collection of American scholar and bibliographer Milton McClintock Gatch. 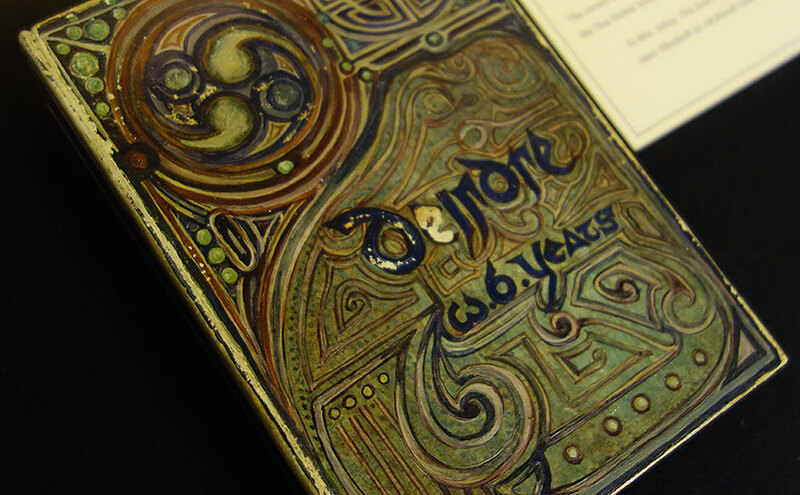 In all, 32 volumes from the Gatch Collection have been added to the Hesburgh Library. This adds significantly to the already rich Yeats Collection at the Hesburgh Library. Besides editions of books by W. B. Yeats, the Library holds a collection of Abbey Theatre Programmes, a Cuala Press collection (the printing press of the Yeats sisters) and a considerable collection of books illustrated by Jack B. Yeats. The exhibit is open to the public 9:00am to 5:00pm, Monday through Friday, through October 30, 2015. 2015 marks many anniversaries of Vatican II, including the upcoming 50th anniversary of the closing of the Second Vatican Ecumenical Council in December of 1965. The Vatican II collection and Catholic Pamphlets collection in Rare Books & Special Collections provide a window into the Council. The Vatican II collection includes schemata, the outlines and drafts of the key documents of Vatican II, along with news service reports and other documents circulated during the Council. These primary sources contrast with the popular Catholic pamphlets produced during and after the Council. 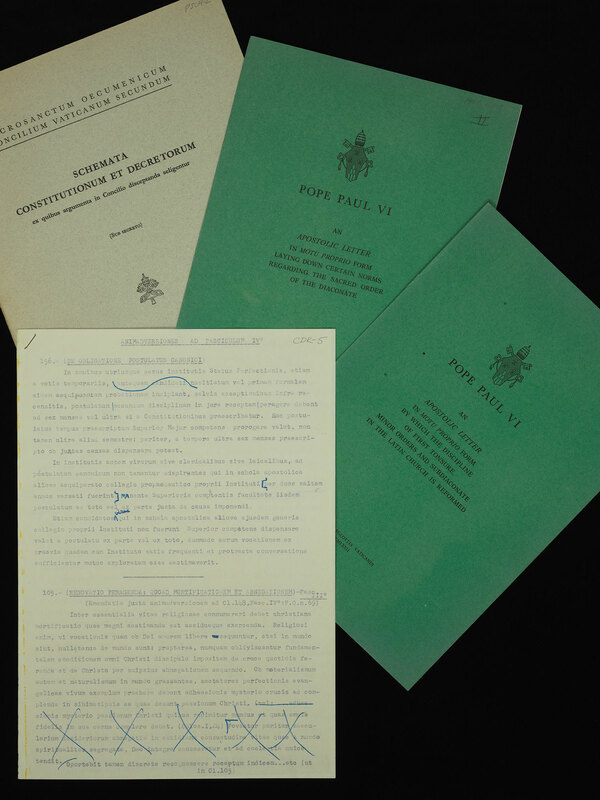 Our holdings include the Address delivered by His Holiness Pope John XXIII at the solemn opening of the Second Vatican Council October 11, 1962 and the Closing speeches: Vatican Council II, December 7-8, 1965. Between these sessions and even later, Vatican II provided the subject matter for many a popular Catholic pamphlet, bringing the Council to the people. Some examples: You and the ecumenical council (1962); Decree on Eastern Catholic churches (1966); Vatican II and youth (1967); What is the lay apostolate? : taken from Vatican II’s Decree on the Apostolate of the Laity – Apostolicam Actuositatem (1979). 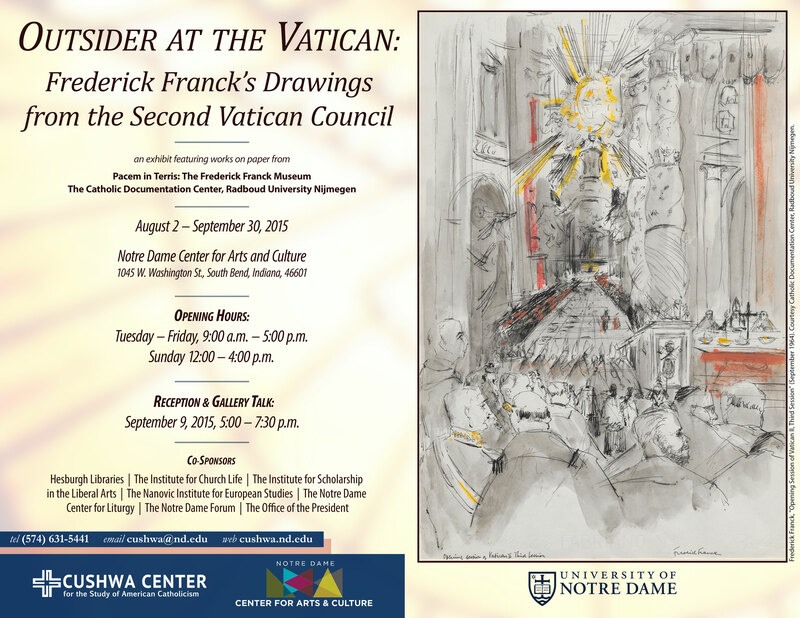 In addition to exploring our library holdings, please visit the fascinating exhibit, Outsider at the Vatican: Frederick Franck’s Drawings from the Second Vatican Council. 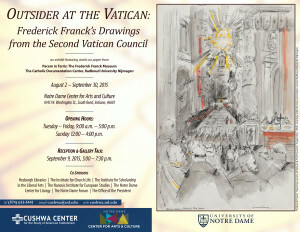 Curated by Catherine Osborne, postdoctoral fellow at the Cushwa Center for the Study of American Catholicism, the exhibit displays rarely seen drawings by Franck that he produced during his visits to all the sessions of the Second Vatican Council. The exhibit runs through September 30, 2015 at the Notre Dame Center for Notre Dame Center for Arts and Culture, 1045 West Washington Street, South Bend. Hours are Sunday 12:00-4:00 p.m. and Tuesday-Friday, 9:00 a.m.-5:00 p.m. The exhibit is free and open to the public. On Friday, September 11, 2015, the Fall exhibit, After Gutenberg: Print, Books, and Knowledge in Germany through the Long Sixteenth Century opened. Thomas A. Brady, Jr., a historian of sixteenth-century Germany and Professor Emeritus of History at the University of California, Berkeley, delivered the keynote address. Also marking the opening was a two-day conference, Beyond Tradition: Rethinking Early Modern Europe, which contextualized the exhibit and highlighted institutions, religious practices, and knowledge in Europe during the long sixteenth century. 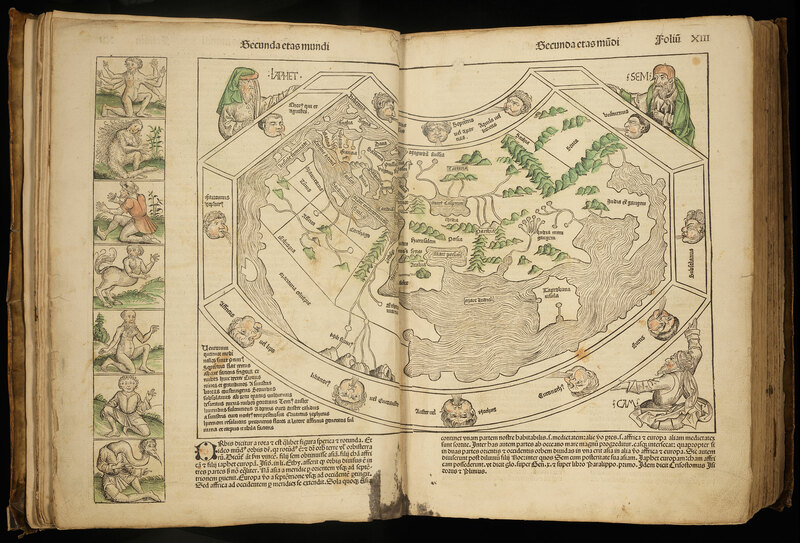 After Gutenberg: Print, Books, and Knowledge in Germany through the Long Sixteenth Century features materials from Notre Dame’s rare books collection that represent an array of knowledge that circulated widely in Germany in the two centuries following Gutenberg’s breakthrough. 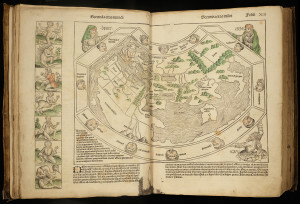 Between the mid-fifteenth century and the end of the Thirty Years War in 1648, the printing press made it possible for Germans to learn about their own history as well as about peoples in distant lands; to read previously inaccessible texts in the original languages and in German translations; to explore artistic techniques and scientific principles; and to harness natural resources from untapped sources. An expanded online exhibit will be released later in Fall that will feature additional images and explanations of the materials on display as well as other objects not in the physical exhibit. Watch for a blog announcement when this is released. Happy Birthday, Dante! In May of 1865, the city of Florence honored the 600th birthday of Dante Alighieri with a lavish three-day festival that included public celebrations of the author’s works, concerts, and exhibitions. Our current spotlight exhibit displays some of the literary and commemorative publications released in conjunction with this important festival. 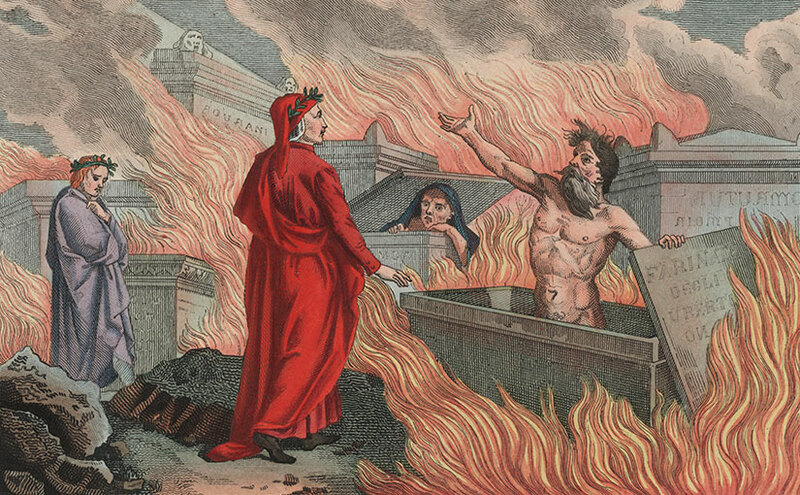 The exhibit runs concurrently to the special lecture series “Dante’s Other Works” 2015: A Celebration of the 750th Anniversary of Dante’s Birth sponsored by the William & Katherine Devers Program in Dante Studies and Italian Studies at Notre Dame. The exhibit is curated by Tracy Bergstrom, Curator, Zahm Dante and Early Italian Imprints Collection, and is open to the public 9:00am to 5:00pm, Monday through Friday, through December 18, 2015. Come visit the current spotlight exhibit curated by David Dressing, Latin American, Latino, and Iberian Studies Librarian. 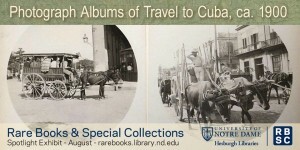 Maintain that summer travel state of mind with a visit to our August Spotlight Exhibit, “Photograph Albums of Travel to Cuba, ca. 1900.” The recently acquired collection features two albums, the Liebee Family Cuba Photo Album and the Gómez Souvenir Album. The two albums illustrate the manner in which late nineteenth-century travelers memorialized their journeys through photography. The exhibit is open to the public 9:00am to 5:00pm, Monday through Friday, through September 30, 2015. 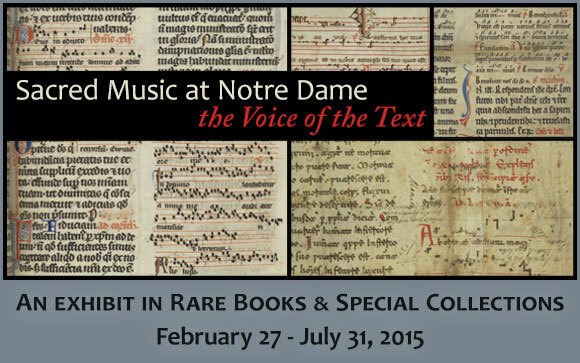 There’s still time to see the Special Collections spring and summer 2015 exhibit, Sacred Music at Notre Dame: the Voice of the Text, curated by Dr. David T. Gura, Curator, Ancient and Medieval Manuscripts. 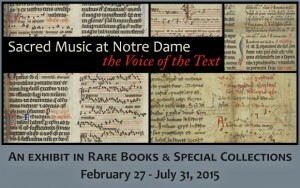 This exhibition highlights the variety of medieval liturgical manuscripts and fragments housed in the University of Notre Dame’s Hesburgh Library which contain music. The manuscripts featured date from the eleventh through fifteenth century, and originate from various regions in France, Germany, Austria, and Italy. Some examples represent specific uses such as Carthusian monks or Dominican nuns. Other manuscripts in this exhibit were recovered from book bindings and serve as examples of older practices which may no longer exist in complete manuscripts. The exhibit was featured as the cover story for ND Works in June 2015. Select chants from the manuscripts on display were performed and recorded by Prof. Alexander Blachly (Department of Music, Notre Dame) and the Notre Dame Schola Musicorum. Audio files of these chants can be listened to online. The exhibit is open to the public 9:00am to 5:00pm, Monday through Friday, through July 31, 2015.